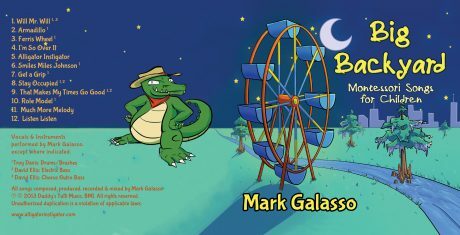 Big Backyard was created by Mark Galasso during his tenure teaching music to pre-school children at Montessori Children’s House (Circa 1968), the oldest private Montessori School in Baton Rouge, Louisiana. The songs bloomed naturally from direct experiences working with the children in a joyful and productive environment. Having been affiliated with Montessori since childhood, the songs are imbued with educational and ethical principles of the Montessori Method. Many of them are quite short by design as they were written with pre-school aged children in mind. But, they are also sophisticated enough that adults will like them too. Big Backyard’s production and orchestration is manifest with cohesive and intricate parts woven into playful tapestries of ear candy for children. 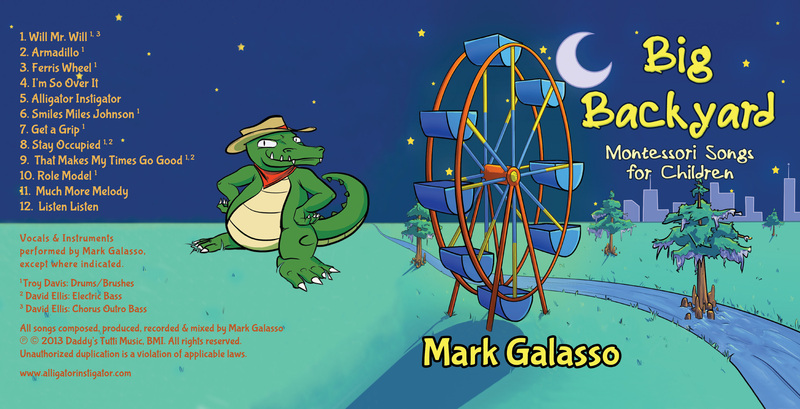 Vocals & Instruments performed by Mark Galasso. Except where indicated. David Ellis: Electric Bass – Tracks 8, 9 + Chorus Outro Bass on “Will Mr. Will”. All songs composed, produced, recorded & mixed by Mark Galasso. © 2013 Daddy’s Tutti Music, BMI. CD/Album Release date April 4, 2013.